GAIL CAREERS OPPORTUNITIES IN VARIOUS DISCIPLINES. GAIL (India) Limited is one of the leading Maharatna Public sector company and India's flagship Natural Gas Company, is integrating all aspects of the Natural Gas value chain and its related services. In a rapidly changing scenario, GAIL spearheading the move to a new era of clean fuel industrialization by creating a quadrilateral of green energy corridors connecting major consumption centres in India with major gas fields, LNG terminals and other cross border gas sourcing points while also expanding its business overseas, thus becoming a formidable player in the International Market. “Chemical/Petrochemical/Chemical Technology/Petrochemical Technology/Mechanical /Production/ Production & industrial/Manufacturing/ Mechanical & Automobile”. Candidates having diploma in one of the following stream: “Electrical / Electrical & Electronics /Mechanical /Instrumentation/Civil” with at least 60% marks. 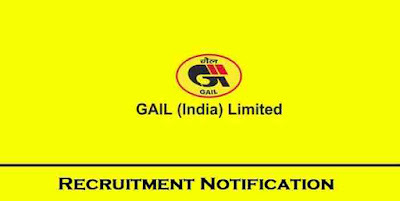 Should have age less than 28 years for applying these job profiles under this GAIL Recruitment 2018. Having Master degree (M.Sc.) in Chemistry with minimum 55 % marks. Literature with minimum 55% marks can apply. 10th pass + ITI Tradesman ship/ National Apprenticeship Certificate in relevant Trades. Should have age less than 26 years for applying these job profiles. Graduation degree with minimum 55% marks can apply for this GAIL Careers making opening. Those who have a Bachelor Degree in Commerce stream with minimum 55% marks. Graduation degree (BBA/BBS/BBM) with minimum 55% marks can apply for this GAIL Recruitment 2018. Graduation degree with minimum 55% marks. Paying Method: You can pay Application fee through SBI collect or Challan. There is no other way for the payment of the application fee. 14TH Nov. 2018 is the Opening Date.